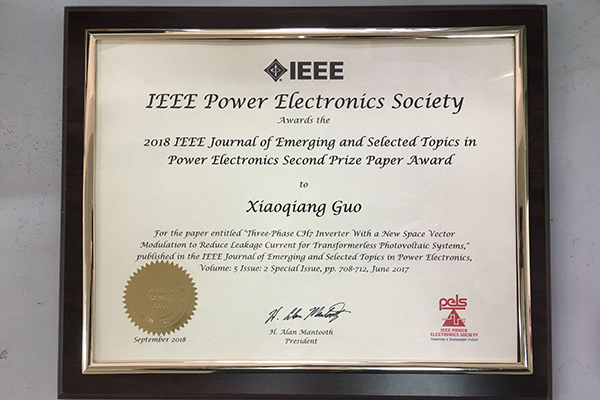 [News from the News Center] Recently, Dr. Guo Xiaoqiang from YSU School of Electrical Engineering won the IEEE JESTPE Prize Paper Award. Dr. Guo was invited to attend the award ceremony held in the United States. Dr. Alan Mantooth, Chairman of the Board of Directors, presented the award and 500 US dollars prize. This is the first time for a domestic sole author to be awarded this prize in the history of the IEEE Power Electronics Society, which greatly enhances the international impact and popularity of YSU’s electronics discipline. “Three-phase CH7 inverter with a new space vector modulation to reduce leakage current for transformer less photovoltaic systems” was officially published by the quality journal-- IEEE Journal of Emerging and Selected Topics in Power Electronics (JCR Section 1, Impact factor 5.177) in 2017. The paper proposes CH7 current source converter and its space vector modulation theoretical framework, which provides a new solution for the new generation of CHx (x=4, 5, 6, 7, 8, ....N) current source converters. This achievement has implications both in theoretical development and practical application. The research has been funded by the Outstanding Youth Fund of Hebei Province. Guo Xiaoqiang, IEEE Senior Member, Postdoctoral Fellow of LEDAR Lab in Canada, winner of Outstanding Youth Fund of Hebei Province, 100 outstanding innovative talents in Hebei Province, included in Hebei Province “Three-level Talent Program”. He is the Deputy Editor-in-Chief of IET Power Electronics, UK Journal, International SCI Journal Editorial Board of Power Electronics, CPSS Transactions on Vice President of Power Electronics and Applications, Chairman of APEC Branch of the United States, Chairman of IECON Branch of IEEE Industrial Electronics Society, Standing Committee Member of Youth Work Committee of China Power Society, Deputy Chairman of Youth Work Committee of Beijing Power Electronics Society. he has presided over 20 scientific research projects, published more than 90 papers, over 30 articles were published by the IEEE TOP journals, 5 ESI high cited papers, more than 10 national invention patents, and a translations of “High Power Inverter and AC Drive”.